Description: Located between the towns of Cripple Creek and Canon City, Fourmile Creek runs through a scenic gorge called Helena Canyon. This 10- to 15-foot wide stream is a unique wild brown trout fishery often available to our members 12 months a year. The browns, along with a few rainbows, average around 12 inches although some larger trout reach 16 to 18 inches. 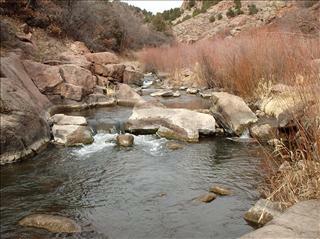 Dry fly fishing in February is a real possibility on Fourmile Creek.